The lineup has been revealed for the 2018 Kansas City Rockfest. The event will take place at Kansas Speedway in Kansas City, KS on June 2 and it will include: Five Finger Death Punch, Ghost, Stone Temple Pilots, Vince Neil, Sevendust, Underoath, I Prevail, Of Mice & Men, 10 Years, Red Sun Rising, Butcher Babies, Miss May I, Powerman 5000, Shaman’s Harvest, Bad Wolves, and Hyborian. The lineup has been revealed for the 2016 Kansas City Rockfest. 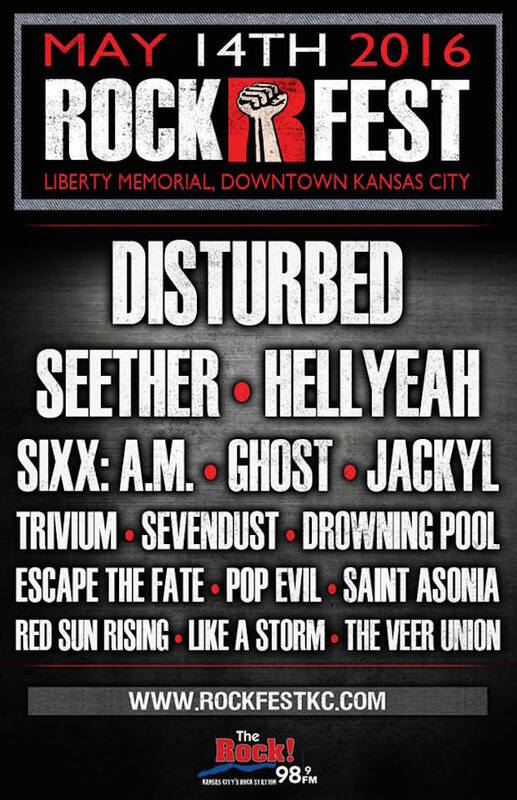 The event will be held at Liberty Memorial in Kansas City, MO on May 14, and will include: Disturbed, HELLYEAH, Seether, Ghost, Sixx:A.M., Trivium, Jackyl, Drowning Pool, Sevendust, Escape the Fate, Pop Evil, Red Sun Rising, Saint Asonia, Like a Storm, and The Veer Union.